Looking for a weekend getaway from Jaipur? Well, you must consider planning a trip to the beautiful town of Nathdwara which is home to numerous tourist spots. Located in the midst of the Aravalli Hills and flourishing on the banks of Banas river, Nathdwara is a must-visit tourist spot for every traveller who is looking forward to escaping the noise of Jaipur and desires to settle down amidst peace for a while. You cannot find such an amazing amalgamation of hills, temples and historical sites everywhere in Rajasthan. So, why not avail this golden opportunity of exploring the hidden beauty of Nathdwara this season? As it is famous for its age-old temples, it is mainly visited by Hindu devotees. How about exploring this beautiful town as a traveller this season? Read on to know more about how to reach Nathdwara and its beautiful attractions. Located in Rajasthan, Nathdwara experiences an extreme type of climate and hence, summers are very hot here. Therefore, the best time to visit Nathdwara is from October until the end of February. However, for Hindu devotees and offbeat travellers, it is a year-round destination. By Air: The best way to reach Nathdwara by air is to take a flight to Udaipur airport and then from there, a bus to the main town. The distance between Nathdwara and Udaipur airport is 55 km and hence, it will take an average time of 1 h 30 min to reach Nathdwara from the airport. By Rail: Being a pilgrimage centre, Nathdwara has a good rail connectivity and hence, you can easily catch a train to Nathdwara railway station from Jaipur. By Road: Nathdwara has a well-maintained road system and therefore, it is easily accessible by road. As route 1 is the fastest taking only 5 h 30 min, i.e., 1 h lesser in comparison to the other route, it is advisable to take route 1. On the way, you can also explore beautiful towns like Ajmer and Rajsamand. One of the most popular cities in Rajasthan and a significant part of the state tourism, Ajmer is located at a distance of about 220 km from Nathdwara and 130 km from Jaipur. It is famous for its several religious sites and is frequented by people from all castes, creeds and religions. Situated amid the Aravalli Hills, the natural beauty of the city also deserves to be explored. The major places here include Ajmer Sharif Dargah, Ajmer Jain Temple, Mayo College and Akbari Fort and Museum. Isn't it a beautiful place which must be explored by every traveller? So, do not miss out on witnessing its splendours while on your way to Nathdwara from Jaipur. Another beauty which you can encounter on your way, Rajsamand is an ancient settlement with its history dating back to the Medieval Period of India. Even though there are not many places to stop by, it is still visited by tourists from all over the country only on account of its historical importance and natural beauty, which is spread in the form of Rajsamand Lake. The lake is said to have been built during the 17th century by a Mewar king so that it could cater to the water needs of the nearby towns. Rajsamand is located at a distance of about 330 km from Jaipur and 20 km from Nathdwara and is a must-visit tourist spot. Located at a distance of about 350 km from Jaipur, Nathdwara is an ideal getaway for every tourist looking forward to enjoying a peaceful trip. Due to the presence of lush green surroundings and divine temples, it maintains a composed and serene aura, which can certainly help you gain peace of mind. Following are the major places which you cannot miss visiting, such is their majesty and popularity. 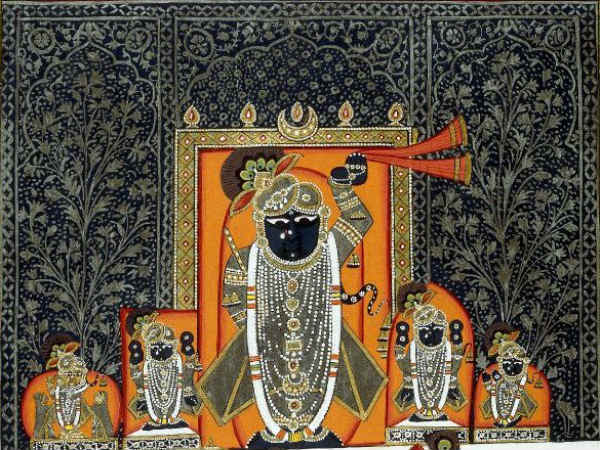 Do you know Shrinathji Temple is so popular that Nathdwara is nicknamed Shrinathji by its visitors? Dedicated to Lord Shrinathji, a 14th-century incarnation of Lord Krishna, the temple is said to have been established during the 17th century by a king of Mewar. The deity present inside the temple was brought from Mathura in order to protect it from the attack of the Mughals. Today, this temple is one of the revered pilgrimage sites in Rajasthan. How about getting yourself to this ancient temple of historical importance and learning in detail about its legends of survival and formation? Nathdwara is also famous for its Pichwai paintings, which are known for their relation to Lord Shrinathji, ivory articles, terracotta designs and handicrafts. If you desire to learn about the culture and traditions of Nathdwara, then its markets are perfect spots to visit. Wouldn't you love to buy such things which you can find nowhere else in the world? If yes, then do not forget to visit Nathdwara markets. Another popular tourist spot and temple dedicated to Lord Krishna, Dwarkadheesh Temple is one of the oldest temples in the town and hence, it is a site of religious as well as historical importance. The temple is visited by thousands of tourists every year who come here to enjoy its spiritual surroundings and pleasant aura. The major festivals celebrated here include Janmashtami and Diwali.